You can cook and prepare meat in many different ways. It is a versatile kitchen ingredient that has been nourishing humanity since time immemorial. Throughout the course of history, we stumbled on the idea that grinding meat can create new and interesting dishes. Of course, ground meat is already commercially available. You can find it in your local grocery store or meat market. But what many people don’t know is how different pre-packaged ground meat is to freshly-ground meat when it comes to flavor. There is a big difference in texture, quality and freshness. Obviously, fresh ground meat is more superior. Not all meat grinders that you can see today have the same attributes. They may have differences in features and performance that change the consistency of the ground meat as well as how easy they are to use. This is why it’s important to be discerning when you are searching for the best manual meat grinder. For now, educating yourself about this particular kitchen amenity is highly necessary. If you want a manual meat grinder that can serve your needs and preferences, make sure that you are well aware of how to choose the right one. Don't fret if you are still oblivious to these things right now. I am here to share my knowledge regarding the key features that determine the quality of a particular meat grinder. A great deal of research was involved before I created this buying guide. I've done the best I can to consolidate all key and relevant information into this post. Before getting a meat grinder, always consider first the kitchen space that you have. 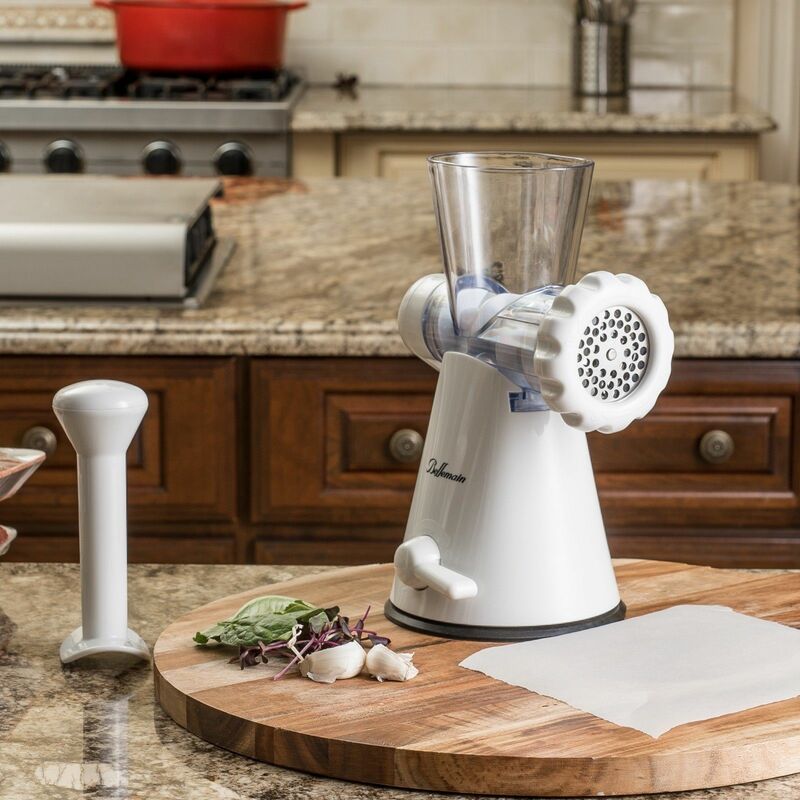 Is there enough space on your kitchen counter for a bulky meat grinder? Can it support heavy kitchen wares? Or should you just settle on compact and lightweight models? These questions can really determine the exact dimensions of the meat grinder that you should get. You need to be wary about the size of the meat grinder. You will always have to mind the storage and mobility of the item inside your kitchen. If your kitchen is spacious, then you are free to choose larger meat grinders. If not, then you should go with the more compact ones. Furthermore, you have to realize that large meat grinders are heavy. It makes them difficult to move from time to time. If you are going to use the meat grinder frequently, a bulky meat grinder might be a bit of an inconvenience. At the same time, these heavy-duty meat grinders have impressive durability and require less maintenance. Meat grinders don't come cheap. They are still considered a fairly expensive investment. Therefore, it is pretty apparent that people would want to get the most out of these units. Specifically, a meat grinder should be capable of performing a variety of grinding tasks. It should be able to create flank, chunk, and other types of cuts. In this way, your versatility in the kitchen will never be limited. The flexibility of a meat grinder is dependent on its blades. You should be able to modify the thickness of the grind so that you can make different cuts. Moreover, you should know the amount of meat that can be processed by the grinder at once. These factors can determine if a particular grinder is a good choice for you, or not. It is a frustrating sight to see your meat grinder break or crack while you are using it. I have been in such a situation before and it really made me mad and agitated. I paid a hefty amount of cash for that grinder and it just broke after four months? That's not something that I anticipated. Fortunately, I definitely learned my lesson. I promised myself to only get a grinder that has a guaranteed rigidity and durability. A manual meat grinder should be crafted from heavy-duty stainless steel and other food-safe metals and plastic. It is easy to be confident in the grinder if it is made sturdily. It should be a shock and impact resistant so that it will survive accidents. Furthermore, it is also essential that the grinder is waterproof. In this way, it can repel the formation of rust and corrosion. Don't forget to inspect the internal components of the meat grinder. Check the gears and blades and see if they are durable enough to withstand constant usage. If you are going to use a plastic grinder, make sure that it has an industrial-grade and food-safe rating. Manual meat grinders are different from automated or electric meat grinders for obvious reasons. The lack of automated and simplified features made manual meat grinders more "old-school" and bothersome for some. Despite this, manual meat grinders are still loved by many users because of the simplicity and control they provide. Manual meat grinders assure their users that there is no over-complex process or design that hinders the usability of the meat grinder. The cleanliness and safety of the food will be thoroughly preserved throughout the grinding process. These perks should be exhibited by a manual meat grinder. Specifically, the unit should be easy to use. The operation should be hassle-free, and the setup should remain stable at all times. Even cleaning and maintaining should not pose any problem on your part. One of the finest household-type manual meat grinders today is this product from Gideon. The tool itself has very impressive ergonomics that allow you to use it easily. You just need to place the meat on its receiver and you can start turning the crank already. It can convert whole meat cuts into fine and coarse grounds without experiencing any hassle. 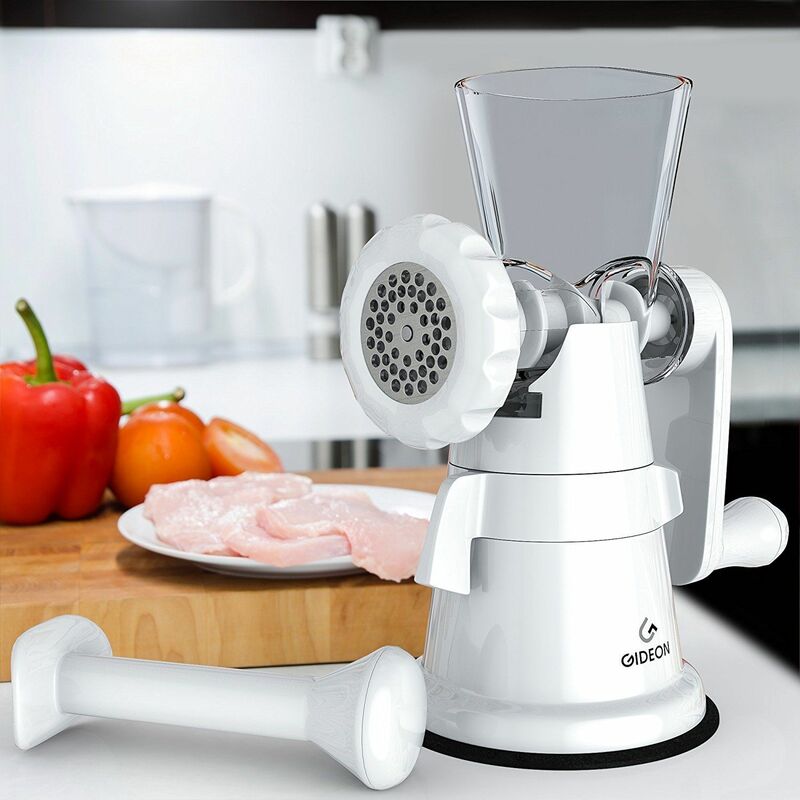 The Gideon Hand Crank Manual Meat Grinder is crafted from the combination of stainless steel and heavy-duty plastic. All of the parts are food safe; no chemical and flavor interaction will take place while you are grinding meat products. Overall, the design of this meat grinder ensures long-lasting performance and durability. This unit features two stainless steel screens and two plates. Specifically, you can utilize the coarse and fine plates to provide variation to your output. Of course, this meat grinder is extremely safe to use. All the sharp and edgy parts will always be out of the reach of your hands. The Bellemain Manual Meat Grinder is a fantastic meat grinder. Several of my friends and family have this unit stored in their kitchens. According to them, this particular meat grinder can do a decent job in making fine and coarse grounds. Whether the meat is fresh or thawed, this tool will be able to handle it. Just like the Gideon Manual Meat Grinder, the Bellemain features a simple and stress-free operation. It can give you full control over the ingredient that you are working with. Such capability ensures that the ground meat will always be of the highest quality. Additionally, the base of this meat grinder has a strong suction. Once you have affixed it to your table or counter, it will not move at all. Cleaning the Bellemain Manual Meat Grinder is pretty straightforward. You can disassemble the entire device, so you can clean it and all its hard-to-reach areas. The entire manual meat grinder is dishwasher safe, so it would only take a couple of minutes before the grinder becomes squeaky-clean again. 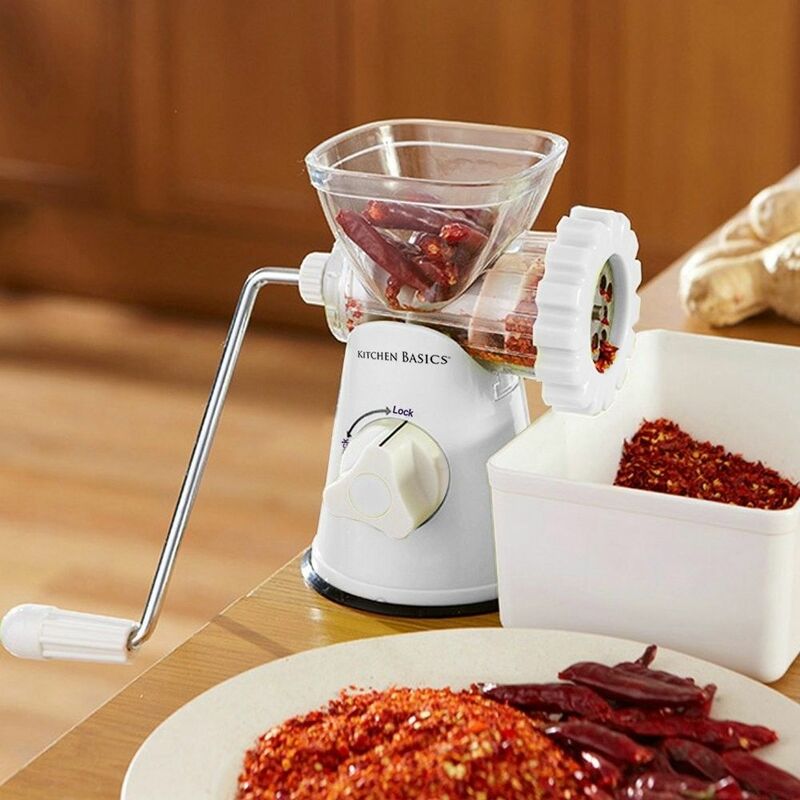 All of the essential features of a manual grinder are present in the Kitchen Basics 3-In-1 Meat Grinder. It is a versatile and highly ergonomic kitchen tool that can work with various kitchen ingredients. It can even grind garlic and beans, too. The fine and coarse mincing plates that come with this meat grinder ensure that all of those feats are achievable. Aside from being a meat grinder, the Kitchen Basics can also create tasty sausages. Just attach the sausage funnel on the body of the grinder and you can already start making these sausages right away. The funnels are available in three sizes so that you can augment the size of the sausages. This meat grinder can also be turned into a pasta maker. There is a pasta attachment that allows you to create two pasta variants: spaghetti and rigatoni. All you need to do is place the dough on the receiver, then turn the crank. You will enjoy how this tool can masterfully create those tasty treats. If you are looking for old-school meat grinders, the LEM Products Stainless Steel Clamp-On Hand Grinder can make you feel nostalgic. Right from the get-go, this meat grinder has the same appearance as the manual meat grinders that your grandparents used to use. But don't let this fool you. There are several innovations that have been integrated into this product to improve its overall performance. The construction of this manual meat grinder is a proof of that. It is extremely solid and does not succumb to rust and corrosion. It remains sturdy after several years of usage. It is not difficult to clean, either. Moreover, the manufacturer made the assurance that the parts do not contain harmful chemicals. Unlike the first three meat grinders that I featured, the LEM Products Hand Grinder does not use a suction base. Instead, it uses a clamp for mounting. As long as you lock the clamp properly, the meat grinder becomes immovable. Since the clamp has a large mouth, it can fit into various tables and countertops. When it comes to inexpensive meat grinders that you can rely on at home, this one does not disappoint. It has straightforward mechanisms that even people new to cooking will find easy to use. It allows you to grind not just meats but an assortment of other ingredients like nuts and fruits. Although it is made from plastic materials, it has a sturdy construction that will allow you to utilize this to the fullest. It stays attached to any surface so there’s no possibility of the grinder falling off the countertop when using it. It’s also hard to say no to its compact features. Fairly easy to clean and maintain. There are not a lot of parts that require cleaning. Which of these recommendations should you spend your money on? You can’t go wrong with the Simple Being Manual Meat Grinder Set if you have a small kitchen. It occupies a small footprint so there should be no issues if you have a limited counter space. It’s also one of the least expensive options out there. If you like the traditional kind of grinder, spring for the LEM Products #10 Stainless Steel Clamp-On Hand Grinder. It will last you for a long time. 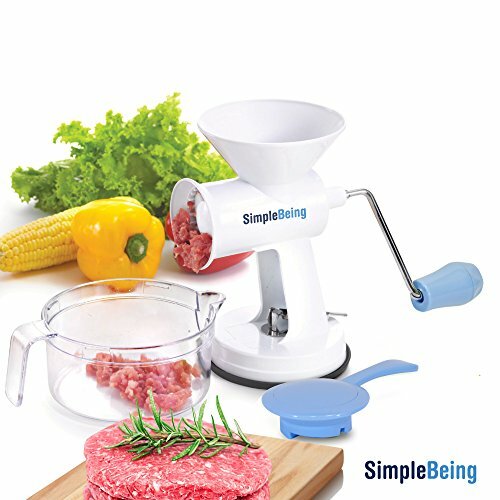 For those who love to experiment with food, you will like the Kitchen Basics 3-in-1 Meat and Vegetable Grinder that doesn’t just perform well as a grinder but also works as a sausage and pasta maker. 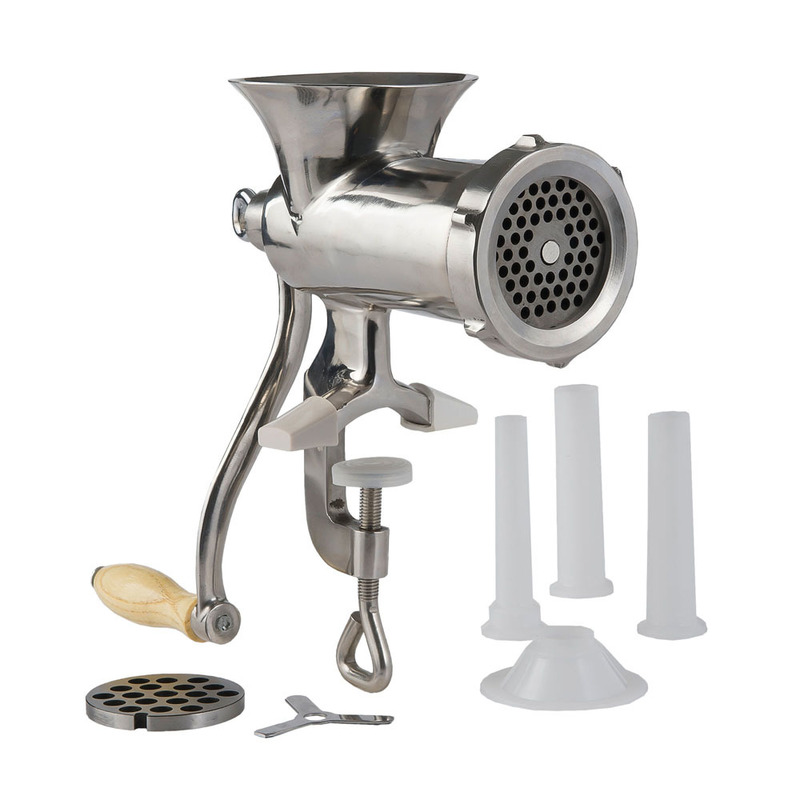 If you prefer something that is fuss-free, the Bellemain Manual Meat Grinder is a great choice with its easy to disassemble and dishwasher-safe features. 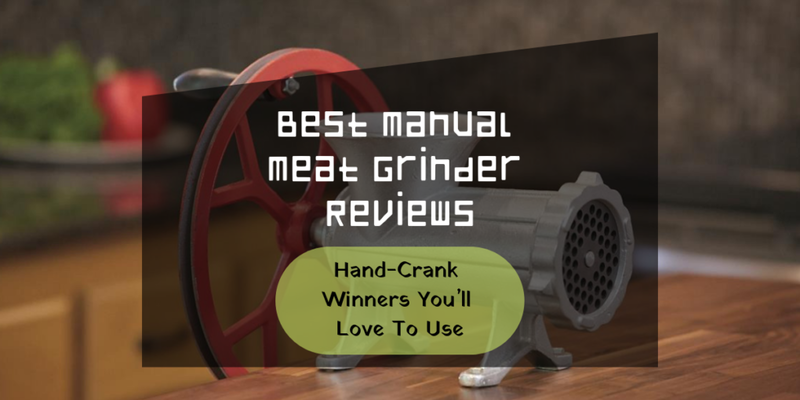 Get the Gideon Hand Crank Manual Meat Grinder if you are looking for something that has more features and can be relied on for more grinding needs. There are many other kitchen equipments and tools you should consider adding to your home. Turn to my homepage for some recommendations and tips on how to buy.